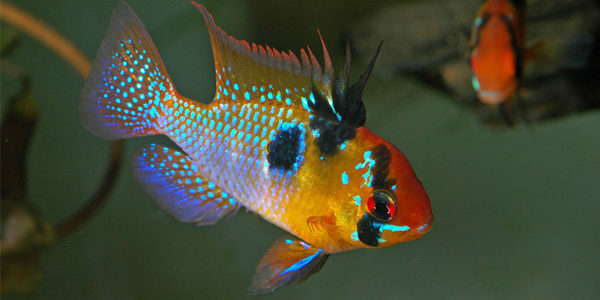 The colorful, adventurous cichlid that is sure to add life to your planted aquarium! The German Ram (Mikrogeophagus ramirezi) is an active fish that is making it's way to the front of popular cichlids that are often added to a 20 gallon or larger freshwater aquarium. This active fish is ready to explore in your aquarium and is sure to be a gem to your collection with it's vibrant coloration and unique fin structure. The Basics: Although this fish falls into the Cichlidae family, they are known to be a more peaceful addition to the home aquarium. They are suitable to be housed with adult live bearers, tetras, and bottom dwelling fish such as corydoras catfish and bristle-nose plecostomus as well as many others. Come see how they actively scour the tank for additional food and playfully nip at ornaments and plants in their habitat. Diet: Ominivorous, but exhibit best coloration with a varied diet and supplemental live foods such as blackworms or brine shrimp. Compatibility: Community fish, unless exhibiting breeding behaviours or multiple males are fighting over a territory. Breeding: Known for their unique habit of pairing for life with a mate. The males are characterized by a "spiked" dorsal fin and usually a more boisterous behaviour when breeding. Females tend to eggs in a small cave or other area they find within the aquarium that they find suitably protected for rearing. Optimal water oxygen levels make success with German Rams much more enjoyable. Below are some ideas for products available in store or on our website to stimulate oxygen levels through added bubbles or bubblers. Talk to one of our sales staff today about the best air pump configuration for you!